(c) Especially cases handled by cheap agents and some of them do not have any registration with Migration Agents Registration Authority and candidates have been applying through them and end up in either visa refusal or visa cancellation. Candidates think that they have engaged cheap agents and saved money but in reality these cheap agents simply dump the applications by filling in names, addresses, contact details without going deeper into requirements of complex and demanding immigration laws and regulations. Who suffer, naturally the candidates and then they seek someone with specialised knowledge so the candidates can again try to lodge applications. Many times we have come across that cases have become so much so spoiled that nothing can be done for those candidates who have either submitted bogus documents or done fraud with Dept. However, the best remedy would be to consult an agent who has experience in dealing with rejected and complex cases. Our processing fees vary case to case and are subject to the complexity of the case and amount of work involved. We also offer initial consultations for those who want to better understand the visa process and their options, after which we will advise of our charges if you wish to proceed with us. Consultations cost from A$100-$200 or more depending on the complexity of the case. 4. Finally you can consult experienced registered migration agent and provide him/her all your details so agent will be able to understand the situation as a ‘whole’ and not as segmentations. Immigration laws have changed several times and you may be benefited by laws prevailing at the time of your application or agent will have more deeper knowledge to solve your case and of course, you must be willing to bear the costs as nothing is free in Western World so the case with agents working in Australia. Many applicants expect free services and services at cheaper prices which is not possible with us, however, you should feel free to shop around and then to decide who will be the best to solve your rejected and complex case. • We can be contacted at contact details provided and we will try our best to attend your case as early as possible. Please feel free to contact us anytime suitable to you by email or phone. Why it has becom too hard for Partner Visa Applicants? What is occupational ceilings in skilled migration Australia? 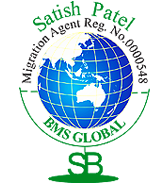 Mr. Satish Patel is a Registered Migration Agent No.0000548 and he has been providing immigration assistance in various kinds of visas for Australia since last 18 years. 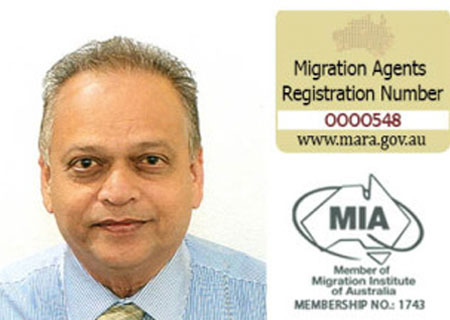 He has successfully dealt with Skilled Migration (Independent and Sponsored), Student Visas, Parents/Visitors/Spouse Visas, Temporary Skill Shortage visa 482, and Permanent Visa under Employment Nomination Scheme and Migration Review Tribunal Appeals (MRT Appeals). Unit 2 / 73 Outram Street West Perth WA 6005 Australia. DISCLAIMER: The information provided on this website is for general purpose only and not a legal advice. We do not accept any responsibility for completeness or accuracy of any information contained on this website or accessed through this website. The user must make his/her own judgment for use of any information on this website and must seek an independent advice either from Dept of Home Affairs (Dept of Immigration) or Registered Migration Agents for the purpose suitable to them. © Copyrights 2018 BMS GLOBAL. All rights reserved.